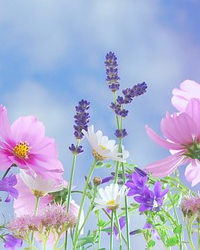 Obituary for Jennie M. Gobrecht | Kenworthy Funeral Home, Inc.
Jennie M. Gobrecht, 93, of Hanover, PA, entered God’s eternal care, Thursday, September 13, 2018 at the Homewood at Plum Creek Nursing Center. Born April 29, 1925 in Hanover, PA, she was the daughter of the late Levi and Mae (Rabenstine) Wildasin. 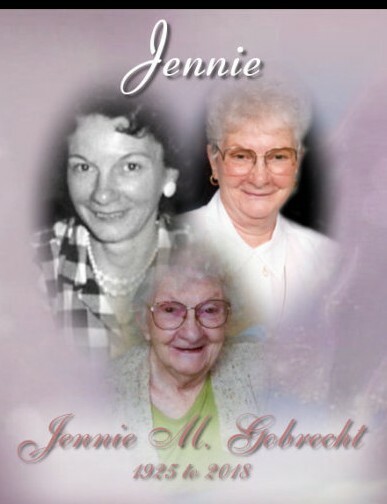 Jennie was the loving wife of the late John E. Gobrecht who died October 28, 2008. Jennie was a member of St. Paul’s Dubs Lutheran Church, Hanover, PA. She enjoyed gardening, sewing, cooking, baking, her birds, took great pride in her fish pond, and in her earlier years was an avid bowler. Mrs. Gobrecht worked hard as a child picking beans and then worked at Revonah Spinning Mills and Barnhart’s Market. She was also a cook at West Manheim Elementary School when it first opened. She and her late husband served as sextons for St. Paul’s Dubs Church for many years. Jennie is survived by three sons, William E. Gobrecht and wife Sally of Hanover, PA, Robert L. Gobrecht of Hanover, PA and companion Patty Beard of New Oxford, PA, and Michael A. Gobrecht and wife Robin of Spring Grove, PA, 8 grandchildren, 2 step grandchildren, 8 great grandchildren, 3 step great grandchildren, one brother, Norman Wildasin of McSherrystown, PA, and two sisters, Evelyn Barnhart of McSherrystown, PA, and Grace Simpson of Hanover, PA. She was preceded in death by one grandson, Kevin Gobrecht, her siblings, Pauline Groft, Helen Dull, Dorothy Lau, Delores Storm, Sterling “Sonny” Wildasin, Raymond Wildasin, Gladys King, and Levi Wildasin, Jr. The Family would like to thank the staff at Homewood at Plum Creek for the wonderful care and attention given to Jennie these last years. A Funeral Service to celebrate and remember Jennie’s life will be held 11 AM, Wednesday, September 19, 2018 at the Kenworthy Funeral Home, Inc., 269 Frederick Street, Hanover, PA, with Rev. Philip K. Nace officiating. Burial will be in Rest Haven Cemetery, Hanover, PA. A visitation and time to share memories with the family will be held from, 10 – 11 AM, Wednesday, September 19, 2018 at the funeral home. In lieu of flowers contributions may be made to St. Paul’s Dubs Lutheran Church, 1958 Dubs Church Road, Hanover, PA 17331.